The attribution to Maffei has been suggested by Francesca Baldassari on the basis of a photograph, and has been confirmed by John.T.Spike. One of the leading artists of the north Italian baroque, Maffei worked in Vicenza and Venice before moving to Padua in the late 1650’s. Although his style was formed in the idiom of late Mannerism, it was noticeably influenced in Venice by late Titian, Tintoretto and Veronese; these influences, however, were mixed with others from the Lombard school, as well as such painters as Johann Liss and Bernardo Strozzi. His most celebrated work is probably The Adoration of the Magi in Vicenza cathedral, completed in 1640 after his return from Venice. Other works decorate the Old Cathedral in Brescia and the church of San Tommaso Cantuariense in Padua, while his Perseus and Medusa can be seen in the Venice Accademia. 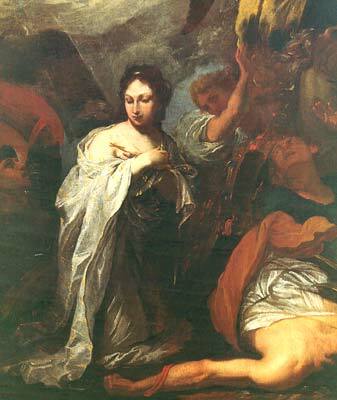 Of the latter and another work, datable from the 1650’s, Ugo Ruggeri has written a telling summary of Maffei’s art which could equally apply to our St.Catherine: both “create powerful emotion and horror through boldly fragmented and dramatic close-up compositions and through the disturbing expressions and gestures of the figures, which may be stylistically indebted to the grotesque art of Pietro della Vecchia”. I am writing to enquire about "St. Catherine"